Each year at the Esri User Conference (Esri UC), student volunteers help with registration, technical sessions, and the Esri Store. In exchange, they network with potential employers and learn about the latest developments in GIS. 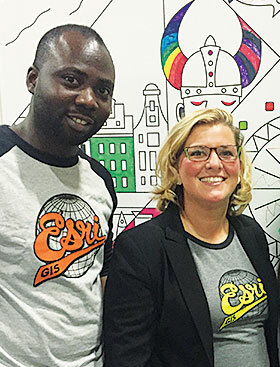 At the 2016 Esri UC, a few students modeled their Esri T-shirts. Paul Ajayi, originally from Nigeria, is a master’s candidate in GIS and remote sensing at South Africa’s University of Witwatersrand. Jessica Leonard recently completed her master’s degree in urban and regional planning from the University of Florida and is now a project manager for the Gainesville Community Redevelopment Agency, where she manages facade grants to help revitalize local neighborhoods. 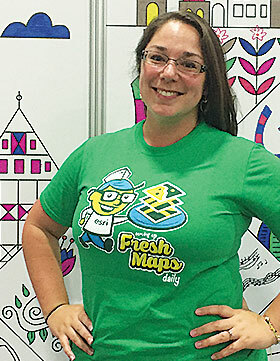 Lindsay Spencer is getting her master’s degree in GIS through Johns Hopkins University’s online program while working at the Pima County, Arizona, Regional Flood Control District and the Planetary Science Institute. Once, she did fluvial (riverine) mapping on Mars using mosaic raster data and Context Camera (CTX) imagery.